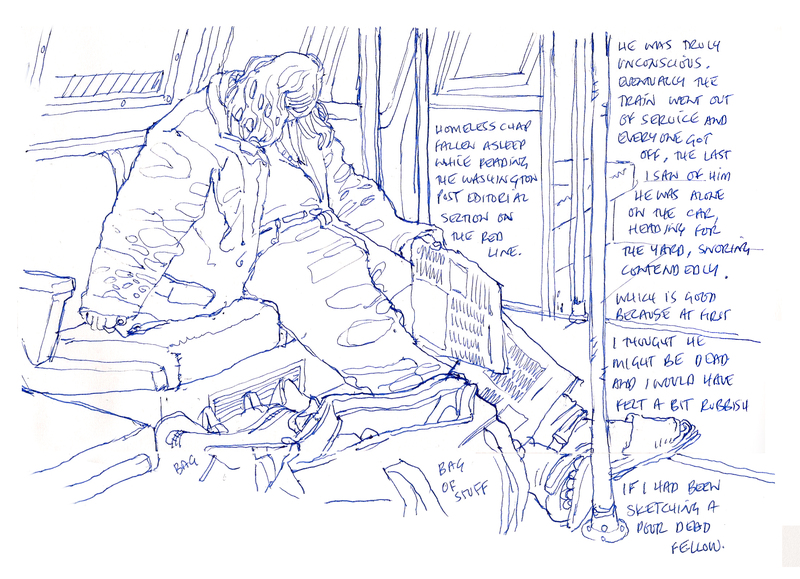 I interviewed reportage artist Richard Johnson back in 2013, talking about his work sketching on location with various military elements in Afghanistan. He has since moved from Toronto’s National Post onto the Washington Post in Washington DC, where he continues to be a fascinating sketcher, taking on the hardest of topics. 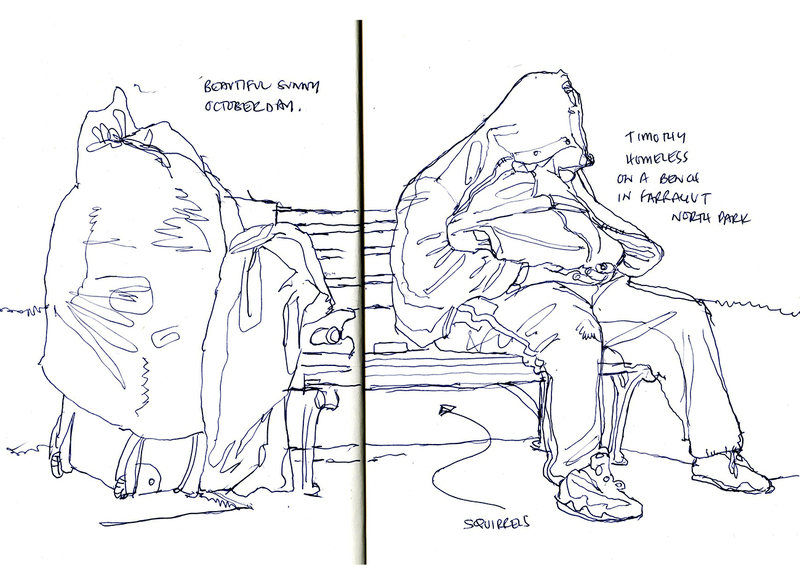 Having spent the spring drawing an in-depth reportage of the trial of Tsarnaev Dzhokar (Boston marathon bomber), he has recently returned home with his sketchbook to address the issue of homelessness in DC. This is a social problem that’s clearly familiar to any urban dweller. But one we are conditioned to ignore. There are so many perfectly good reasons to pass by a homeless person with eyes averted. Everything from shared embarrassment to reasonable caution. We don’t know these people. We’re worried about their mental state. Few of us want to engage face to face. As an introvert myself, I hardly ever talk to any strangers – never mind people who are in quiet crisis. As always, Johnson pushes himself past these reasonable concerns. He has a compulsion to get up close and personal. Giving us his keenly observed portraits, accompanied by the subject's own words. 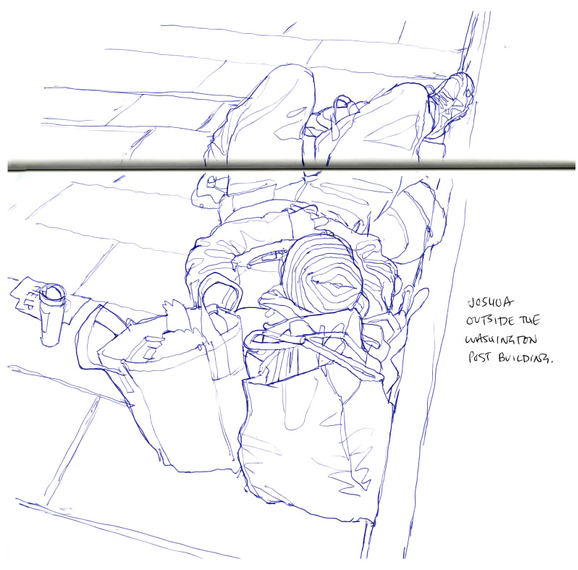 As a location sketcher myself, but not someone who has faced these kinds of raw stories, I’m fascinated with his work. It’s the kind of drawing challenge that many artists think about taking on. So I took a chance to ask him three pointed questions that might help those of us who are thinking about doing this kind of work. His answers were of course on point, and revealing. MTH: Richard, thanks for sharing your reportage on the homeless in DC. I like the fact you talk about how difficult it was to engage with people. That they're not necessarily willing to be drawn. It's an interesting topic for a sketcher.You start the project by sketching people at a distance - would it be fair to say you were dodging the issue of getting permission at first, before eventually finding a way into the story? R.J.: I think what we do as urban sketchers is by its very nature a kind of documentary voyeurism. We draw our own worlds because we want to show them to others, but do it long enough and eventually you end up in some gritty corner drawing graffiti scrawled on some decayed building. You are sketching it not because this is something that you would choose to show others, but because it is something that needs to be shown. 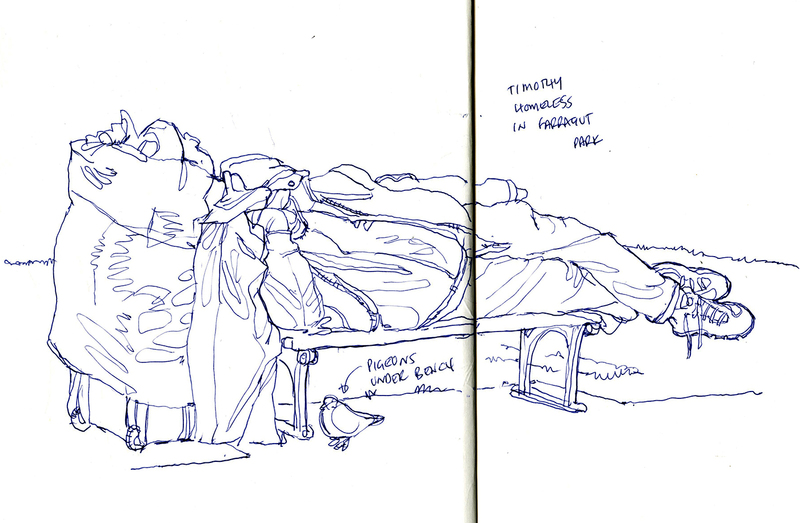 That is how I got to the point where I was surreptitiously drawing the homeless. MTH: Do you have any thoughts on the ethics of drawing without consent? Is it a dicey thing - or do you feel you're on the moral high ground making these drawings? Do you feel it's any different ethically for a reporter than for a hobby-sketcher? R.J.: This is always a thorny question and one that many of us grapple with especially in this changing privacy conscious world. As a visual documentarian though, I consider it my responsibility to capture life in its purest and most natural state. That is why we urban sketchers draw what we see - not what we’d like to see, or what we have staged, or what we took a photo of. The capturing of life while immersed in the same moment as the subjects we draw raises the art we create beyond anything created from a photograph. So in my opinion, if your intentions are pure and your mind is set only on the need to draw what you see, then it makes no difference whether you are drawing buildings or people. You are capturing your world. MTH: Have you ever faced questions about using people's difficult situations to promote yourself? (Bear in mind, I'm on your side!) - but I'm curious about the issues around a reportage artist drawing public attention to their sketches while working with people's true-life stories. R.J.: As much as I love our Urban Sketchers group, I believe that there is much more we could all be doing with our skills. We have an organization that stretches all around the planet and an artistic device that affects people deeply. I think that we should all be looking for opportunities to tell the hard stories. I think we are beginning to see this happen. Some of the artwork, of devastation inside Syria, and of refugees across Europe in the last year has been particularly telling in changing public attitudes. But more to your question, personally, journalistically I never want to be even vaguely perceived as taking from someone in pain in order to promote myself. I am the lens only. There are of course situations where I would not be able to draw without requesting permission first. My work with wounded warriors over the last decade depended on a high degree of trust and acceptance. And sometimes written permission was even necessary in order that there is a clear understanding. But regardless of the paperwork or trust gaining, my own motivation remains the same. I want to tell stories and change minds using pictures and words. This is a power that we all have IF we choose to use it. 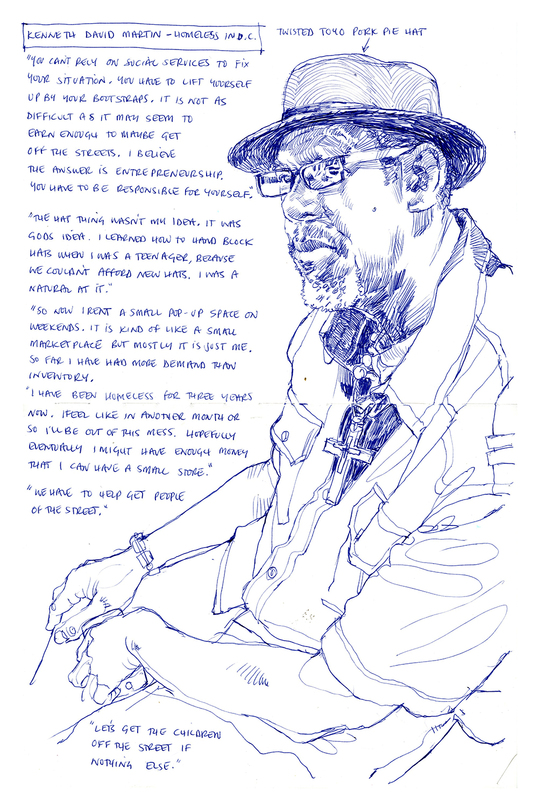 To read Richards full story and see the rest of the drawings, please head over to his Washington Post article Drawing the Invisible. You can also follow his blog at NewsIllustrator.com, or follow Richard on twitter.